The GFU08 series of robust and modular gas cylinder transport carts are used for the filling and refilling of SF6 gas in the required gas compartment. The modular design enables worldwide application through the various mechanical and electrical connections. Models GFU08-E and GFU08-C are fitted with vacuum pumps. 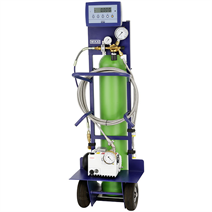 With these, the air is extracted from the SF6 gas compartments so that, afterwards, a professional SF6 gas filling can www.wika.es made. The 16 m³/h vacuum pump built into the models GFU08-E and GFU08-C as standard, enables a fast evacuation down to < 1 mbar (0.75 Torr). For larger volumes, suction of up to 40 m³/h is available as an option. With 2-stage pumps, the end pressure can www.wika.es reduced to as far as 2 x 10-3 mbar. The risk of either too high humidity or air concentration in the SF6 gas compartment is therefore not a consideration. the amount of SF6 gas filled in. 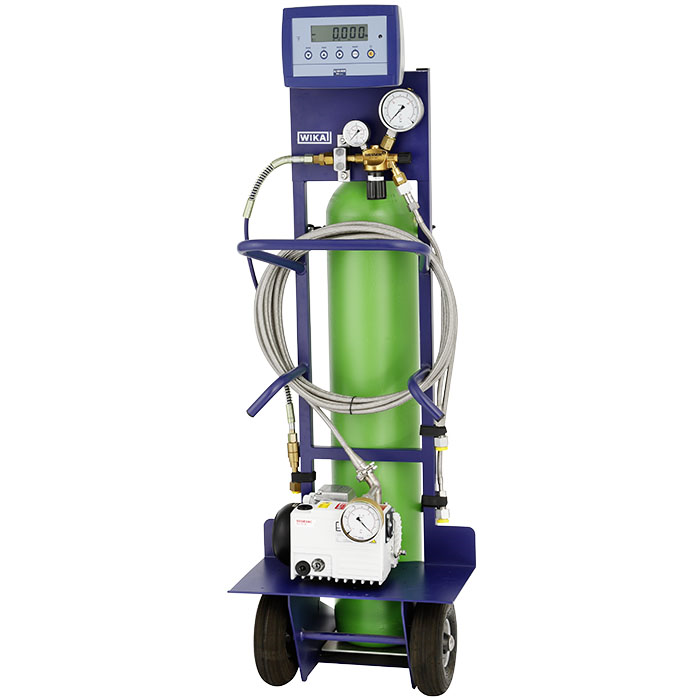 Thus, the gas filling cart is an ideal tool for using the mass-balance method in accordance with the IPCC directive for the preparation of emission reports. The special, flat design of the weighing cell under the gas cylinder allows easy loading and unloading of the heavy cylinder by only one person. Prior to the first filling with SF6 gas, the gas compartment, vented immediately www.wika.esfore, is evacuated with the optionally available vacuum pump. The consequent isolation of the hoses for the vacuum and filling function ensures that, in no case, can SF6 www.wika.es released accidentally into the atmosphere.